is a program that offers agencies the resources, training and support they need to help their clients succeed on the web. One core benefit of the Partners program is the ability to take product certification exams for free. 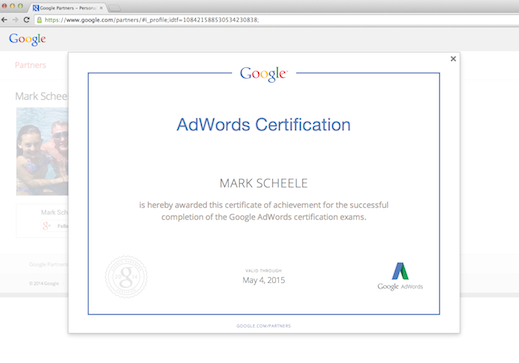 Many of our users have requested certificates to show potential clients that they’re AdWords certified. Today, we’re pleased to announce that there are two new ways to share your certification status on Google Partners. First, anyone who’s AdWords certified can get a personalized HTML certificate on Partners. Second, you now have a publicly sharable profile page, which includes your certifications and information like your name, Google+ profile photo and company affiliation. Click the ‘My profile’ link in the ‘Overview’ section. If you’re AdWords certified, click the ‘AdWords Certified’ link to open a printable, HTML version of your certificate. You can print the certificate or save it to your desktop to share with potential clients. Select the ‘My Profile’ page link from the menu. Visit the ‘Public Profile’ section of this page. By default, your public profile page is visible only to you. You can now click the ‘View Profile’ link and begin sharing your page with anyone. If you’re signed in to your Partners account, your profile's visibility status will appear at the top of the page. You may always change it from public back to private. To learn more information about Google Partners certifications, visit the Help Center. Google Partners is a program that offers agencies the resources, training and support they need to help their clients succeed on the web. One core benefit of the Partners program is the ability to take product certification exams for free. Many of our users have requested certificates to show potential clients that they’re AdWords certified. Today, we’re pleased to announce that there are two new ways to share your certification status on Google Partners.